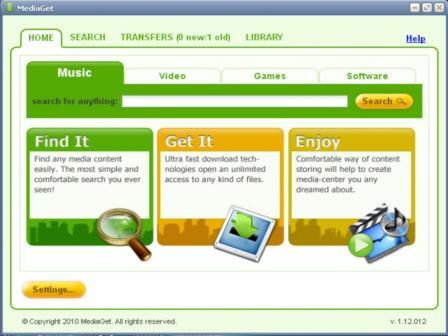 MediaGet is an ingenious software program for searching and downloading media files. The program is excellent for new and experienced users. Some files can be very difficult to find as some may be banned from distributing freely or due to non-operating websites. In cases such as these, these programs will be a tremendous lifesaver. The service supports a large number of torrent-trackers, which makes it very easy to find and download the file you are looking for quickly. With this software, you will be able to enter closed peering networks with free access to any file. - can find files by category such as music, games, programs, films, etc.. The program uses peer-to-peer technology that is based on the principle of file sharing between internet users. The technology is very advanced from ones of the past that even allows large files to be downloaded quickly and effortlessly. The installation of the program will only take a few minutes. The interface is easy to use making it great for beginners. To download all you do is hit one button, the files will be saved on your computer and will be available via the mediateka tag. You will be able to see completed downloads and find any file just by browsing which makes management easy.